I am disturbing the notoriously romantic terrain of landscape painting. In the tradition of natural history scientists, I work from specimens, field studies, photographs, and observation, as well as the literal materials of contemporary industry. These paintings are dirty, they are seductive--a toxic, addictive combination that directly targets all of us dependent on the grid while we simultaneously indulge in fantasies of pristine nature. Since 1997 my work has focused almost entirely on tightly cropped images, as opposed to full-frame views typical of traditional landscape painting. In 2013 I moved to a studio at the edge of the Pacific Ocean, which is imposing new influences on how I perceive space. In these paintings, the horizon line dominates all, democratically mingling common elements of both natural and human-made scenes. The bodies of water that make life possible are essential, beautiful, and compromised. 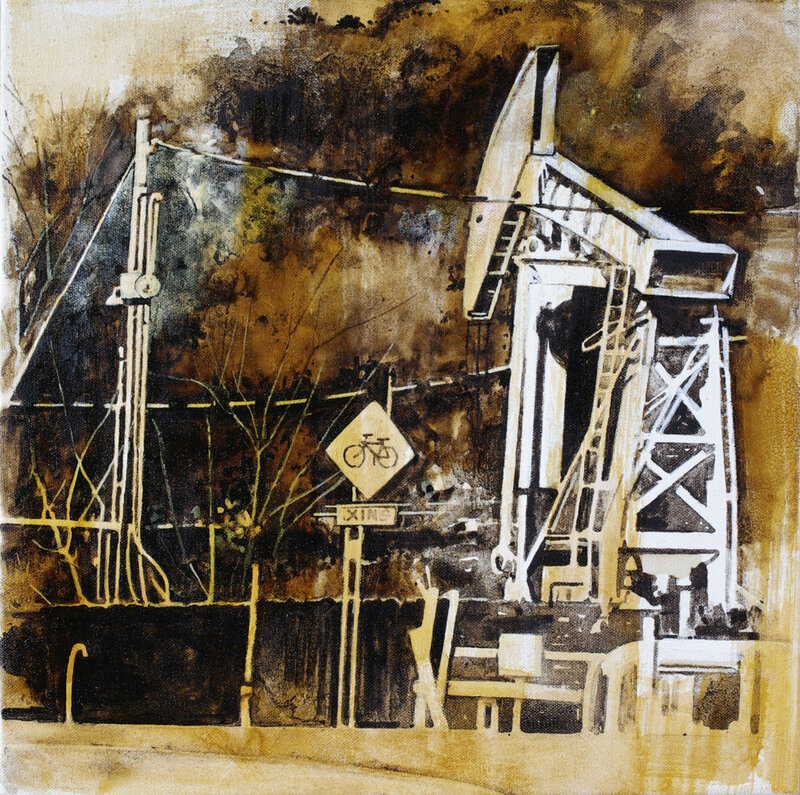 The urgency of this subject is directly rendered in a combination of traditional art materials and petroleum products. The food industry today provides many images of working landscapes. Dependence on the costly twin resources of water and oil make even the most pastoral scenes extensively financed and constructed. Native specimens, invasive plants, and agricultural crops grow together until natural forces or human intervention tip the advantage. Water, chemicals, fire and other disturbances shape Mother Nature's continuous botanical drama. These signature works look at deep expanses of geography, species, and time. The concept was begun in 1997 while I was working in Montana, and continued for many years. This obsessive collection of native and invasive plants breaks with enduring artistic traditions. The cropped, sharply focused images embody the seductive physicality of oil paint, but reject conventions of horizon line, panoramas, grandiose scale, or a lofty "god's eye" view.